15 years ago Jonzi D had an idea that would shake up the UK theatre scene forever. 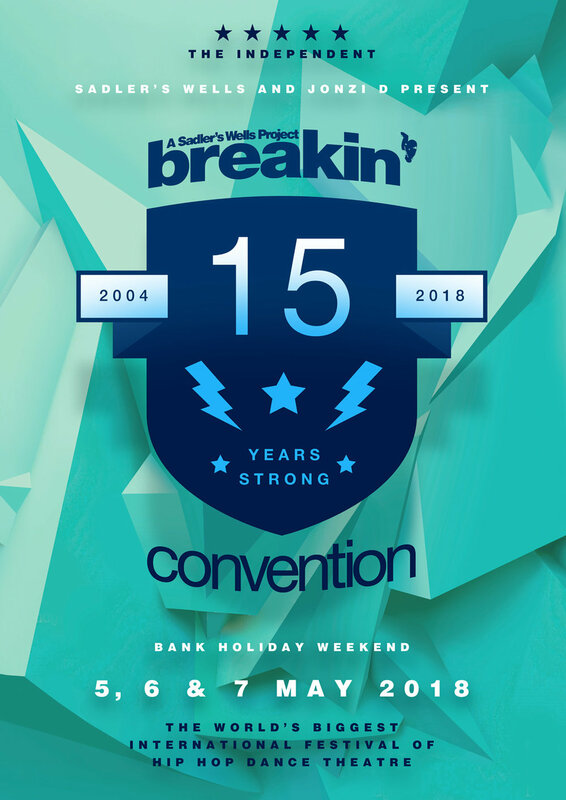 Today that idea is still going strong as Breakin' Convention celebrates its 15th year with an extended programme of events and an awe-inspiring collaboration. But let's go back, way back and look at how it got to where it is today and where it's been along the way. This is a brief history of Breakin' Convention from 2004's first pioneering festival to 2018's landmark anniversary celebrations. In 2003, Jonzi D had the dream of creating a festival to bring together the best hip hop dance theatre performers from around the world on London's doorstep. In 2004 Sadler's Wells helped make that dream a reality as Breakin' Convention, the international festival of hip hop dance theatre, made its debut on the 15th May 2004. The groundbreaking line-up saw artists and groups like Rennie Harris, Benji Reid, ZooNation, Boy Blue and the Electric Boogaloos performing to a sell out audience hungry for the kind of cutting edge hip hop theatre that had been missing from the UK landscape. 2005 saw Breakin' Convention grow not just as a festival but as driving force of hip hop theatre. Alongside the festival for the first time was educational project Hip Hop Hospital; And another first professional development project The Surgery, still going strong today as Open Art Surgery, a one week development course that culminates in a live performance and discussion. 2006's incredible international line-up included ZooNation with work that went on to become Into The Hoods, the West End's longest running hip hop show. It also saw Jonzi D nominated for the Decibel Award in the Southbank Awards, for his outstanding work with the festival. 2007 saw Breakin' Convention get even bigger, expanding the London festival to three days and for the first time taking the festival on tour. The UK tour saw Breakin' Convention bring the best from around the world and around the corner, across the nation to a brand new audience. 2007 was also the year educational project The Pioneers brought dance legend Popin' Pete over to share his knowledge with the UK's leading dance talent. 2008 was a celebration of Breakin' Convention presenting 5 years of cutting edge hip hop dance and theatre. It also saw The Pioneers opened up to dancers across the UK allowing them to learn the roots of hip hop culture from dance legends Suga Pop and Ken Swift. 2009 was the launch of the Future Elements video project, a week where Breakin' Convention offered aspiring young dancers, MCs, producers, film-makers and artists to work with professional hip hop mentors to create their own music video. The Pioneers brought back Ken Swift alongside Tony Go Go once again imparting their unique insight and knowledge to the next generation. Breakin' Convention also went out across the UK on another tour bringing even more cutting edge hip hop right to the nation's doorstep. Not content with having one of the biggest and best line-ups the festival had ever had, 2010 saw Breakin' Convention go straight back out on tour after the incredible success of 2009's national tour. The Pioneers continued to push the UK dance scene this time bringing the multi talented Mr. Wiggles over for intense workshops and panel discussions. In 2011 Open Art Surgery crossed borders for the first time bringing Breakin' Convention's unique professional development course to hip hop artists and performers in Canada. The Pioneers united more hip hip innovators than ever before with Alien Ness, Trac2, Popin' Pete and Shannon 'Which Way' Sha all sharing their experiences, knowledge and skills with more young dancers than ever. Breakin' Convention also had its first commission: Omi created by Tony Adigun in partnership with WIP Villette. The festival also saw the addition of the first Freestyle Funk Forum, an hour-long improvised show created from audience interaction and hip hop's answer to Whose Line Is It Anyway? To be or to MBE? In 2012, Jonzi D declined an offer of an MBE for his pioneering work and dedication to the UK hip hop theatre scene. His decision later inspired his piece The Letter: To Be Or To MBE?. Breakin' Convention continued to flourish with its flagship London festival being live streamed with the BBC and Arts Council England, before embarking on another UK tour. It was also the year that saw the first Back To The Lab, a two week intensive professional development course for choreographers, help solidify the emerging stream of UK talent. 2013 was a landmark year as Breakin' Convention celebrated its 10th year with 10 brand new commissions from UK artists, 10 Tens a project bringing together 10 ten year old's for an inspiring performance at the festival and an incredible array of firsts. The first Park Jam, a celebration of hip hop culture and a return to its roots as Breakin' Convention took over the park and got the public to join in. The first time Boy Blue performed the Emancipation of Expressionism, the critically acclaimed piece that is now part of the GCSE dance syllabus. The first international festival and Freestyle Funk Forum, at the world famous Harlem Apollo, saw an amazing line-up performing at the birthplace of hip hop culture. Wang Ramirez even won a Bessie for their piece in the festival. 2014 saw another awe-inspiring festival line-up including BirdGang performing Ukweli Roach's Vice for the second time before taking it out on the Breakin' Convention UK tour that year. Vice is the first UK work to headline a Breakin' Convention UK tour and represented a turning point in UK hip hop theatre. Park Jam returned bigger and better than ever with more live music, spoken word, dance and graffiti for the public to enjoy. And BCTV, Breakin' Convention's YouTube channel and film-maker project made its debut in a launch night featuring the work of cutting edge emerging artists. Following another great festival line-up, 2015 saw Freestyle Funk Forum take over more venues than ever before with its infectious improvised fun appearing at Lovebox and Rich Mix. 2014's first international festival had now grown into a short US tour of Charlotte, North Carolina and Harlem, New York. Breakin' Convention's first international tour. Breakin' Convention was also inspiring and supporting artists back in the UK more than ever with the first Higher Learning, an education programme of hands on workshops designed to help theatre-makers and performers gain vital insights to the theatre industry. 2016's launch night saw BirdGang performing Vicycle, an extended version of Ukweli Roach's Vice. The Ruggeds shook the London festival with their energetic work Adrenaline before Breakin' Convention toured them across the UK alongside the usual mix of the best from around the world and around the corner. Park Jam brought the community together once again and Moving Rap gave eight schools the chance to combine spoken word, rap and dance in two months of workshops leading up to a live performance. Breakin' Convention also crossed borders once again this time bringing the festival to Luxembourg for the first time and returning to Charlotte. 2017 kicked off with the first Open Art Surgery in Sweden, bringing its unique blend of development, mentorship and discussion to a brand new audience. The festival opening night saw two pioneers collide as Breakin' Convention and Jazz re:freshed provided an evening of hip hop dance accompanied by live jazz music, and the festival saw more ground-breaking crossovers as Breakin' Convention paired with Guerilla Science to combine hip hop with science and learning. Breakin' Convention's national tour brought hip hop dance to cities across the UK, before going international and returning to Luxembourg for the second year running. The festival came to Toronto for the first time, with a line-up featuring work from the Canadian editions of Open Art Surgery. The tour continued to the US returning to Harlem and Charlotte and making its debut in Miami and Denver to record breaking crowds. Celebrating our 15th anniversary, 2018 promises to be our biggest year yet. Kicking off an extended programme of festival events with Park Jam and discussions before our special launch night event. This year's festival features an amazing line-up of artists representing highlights from the festivals rich history and a monumental collaboration with Jazz re:freshed. Rounding off the celebrations is our after party, a true celebration of hip hop music and culture at the o2 Academy, Islington.